Take your children on an imaginary journey to Costa Rica to learn about toucans, monkeys, and jaguars. Play rainforest music and encourage them to use their senses to bring the rainforest alive at home, in your classroom, or in your studio. Get out your rainforest books, look up rainforest videos on YouTube, and gather your rainforest props to get into the mood. Explore the rainforest by having discussions, reading books, and doing related kids’ activities and art projects. Take the learning further by using breathing techniques and yoga poses for kids. Brain research shows us that adding movement to the learning experience stimulates children’s thinking, ultimately making learning more fun and engaging. The “RAINFOREST” FOCUS BREATH is mindful breathing. Come to sitting comfortably on a chair or a cushion with your palms resting on your knees and your spine straight. Take a few breaths to calm your mind and body. Come to the present moment. When you are ready, take a three-count inhale followed by a three-count exhale. Once you have the rhythm of your mindful breathing, start to imagine the sounds you might hear in the rainforest. Think of frogs croaking, birds singing, monkeys howling, snakes hissing, and rain falling. You could also play rainforest sounds in the background to help you imagine sitting in the middle of a rainforest. Imagine the smells of the rainforest and feel the humid heat on your body. Continue with this mindful breathing technique for a few minutes, as long as it feels comfortable to you. The “RAINFOREST” FOCUS YOGA POSE is Standing Forward Bend. Come to standing tall in Mountain Pose with your feet hip-width apart and your arms by your side. Slowly bend your upper body, let your arms hang heavy, and reach for your toes. Imagine that your upper body is the rushing water of a waterfall. Take a few deep breaths and relax your body. Close your eyes, if that feels okay. Keep your knees slightly bent to ease the tension in your back. You could bend your arms, take the opposite elbows in your hands, and swing gently from side to side, if that’s comfortable. Allow your mind and body to rest. When you’re ready, on an inhale, slowly come up to standing by rolling up your back, one vertebrate at a time. Come back to standing in Mountain Pose. The “RAINFOREST” FOCUS YOGA FLOW is Warrior 3 Pose, Standing Forward Bend, and Squat Pose. 1. Warrior 3 Pose – pretend to be a toucan. Stand on one leg. Extend the other leg behind you. Bend your torso forward and take your arms out to the sides. Flap your arms like the wings of the toucan. 2. 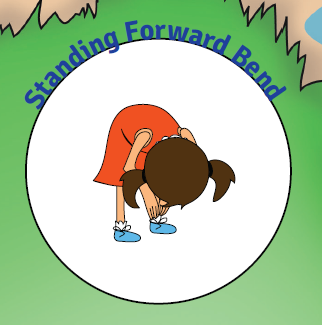 Standing Forward Bend – pretend to be a waterfall. From Mountain Pose, bend your upper body, reach for your toes, and pretend your arms are like the rushing water of a waterfall. 3. Squat Pose – pretend to be a monkey. You can flow gently over and over through these three poses. 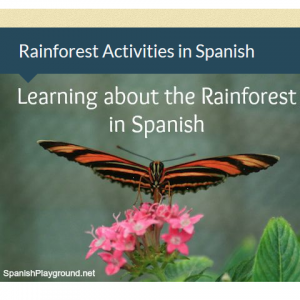 Talk to your children about what else you might see or do in a Central American rainforest. 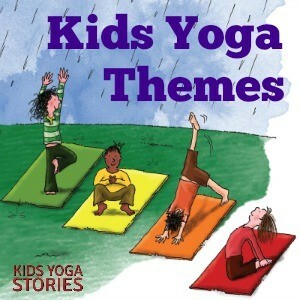 Invent your own rainforest yoga poses or check out our Yoga Poses for Kids page for inspiration. 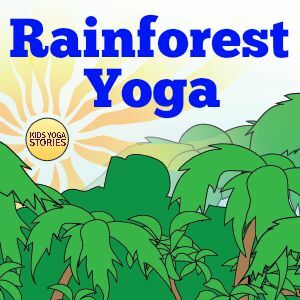 Throughout the month, you could use these three rainforest-inspired yoga poses as a base and add other rainforest yoga poses or breathing techniques to extend the children’s learning. Follow their interests and needs. You will know if their yoga experience should be more calming or if they need something more dynamic and active to help release their pent-up energy. Check out our other rainforest yoga sequences listed below, as well. 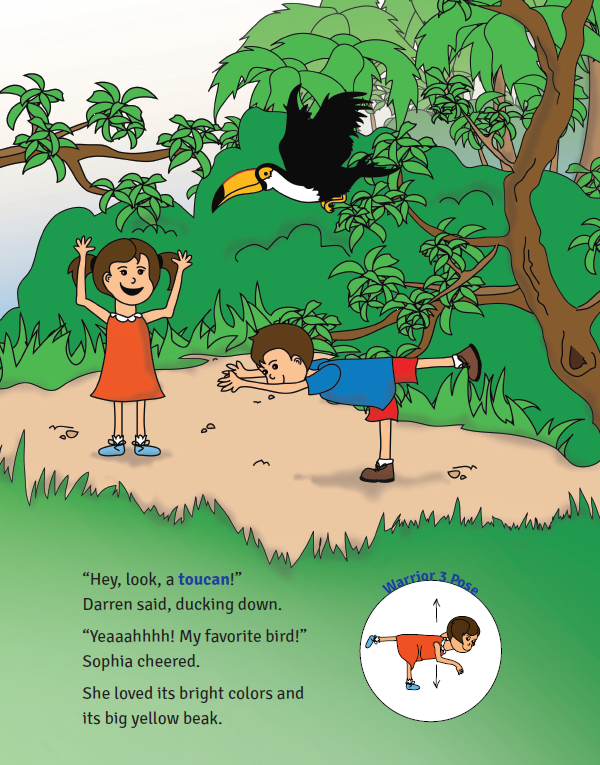 The “RAINFOREST” FOCUS YOGA BOOK is Sophia’s Jungle Adventure. 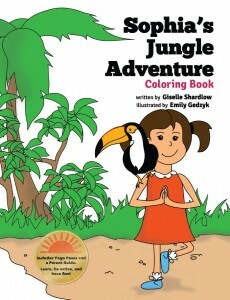 Sophia’s Jungle Adventure was based on my own travels to Costa Rica. I spent a day hiking to the waterfalls near Volcano Arenal. 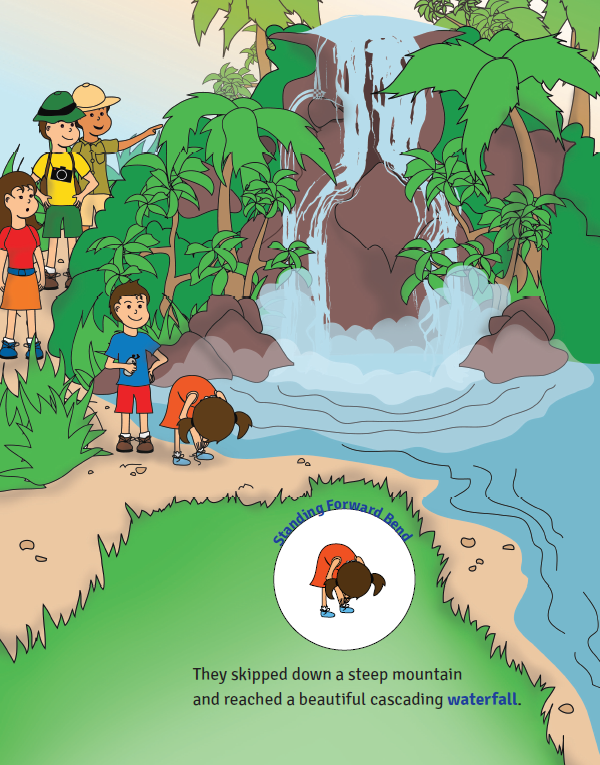 In the yoga story, Sophia and her family act out what they see and hear on their own hike. As they follow along with Sophia, readers fly like a toucan, slither like a snake, and flutter like a butterfly. 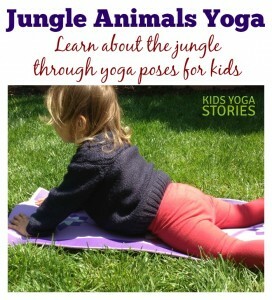 The Sophia’s Jungle Adventure Yoga Cards extend your child’s jungle yoga adventure and offer another opportunity for creative, independent play. 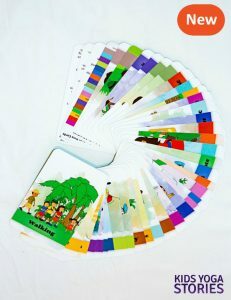 Children can sort the poses or match the poses to the jungle-themed keyword cards. This rainforest yoga book is also available in six other languages: Spanish, Portuguese, French, Chinese, Russian, and German. Sophia lives in San Francisco and is a nature lover who enjoys traveling and writing projects. LEARN ABOUT JUNGLE ANIMALS THROUGH MOVEMENT! 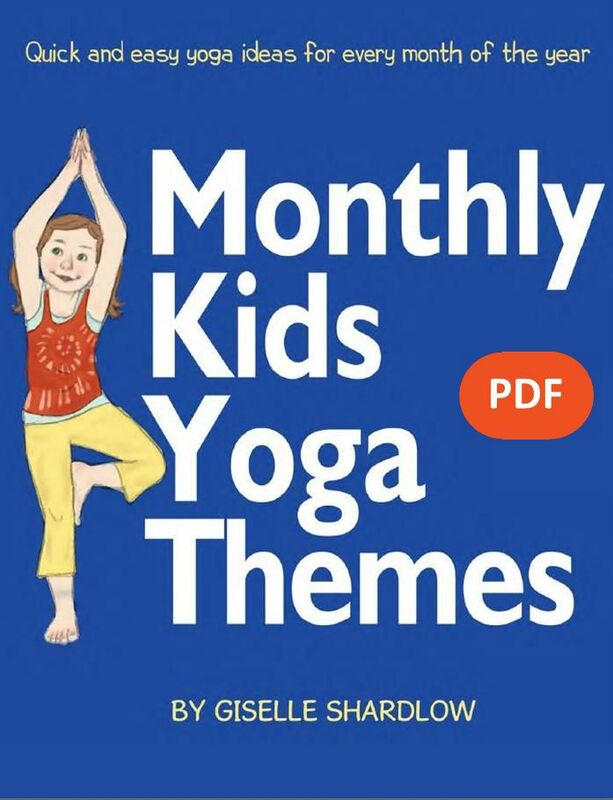 Pretend to be a turtle, toucan, and tapir through basic yoga poses for kids! 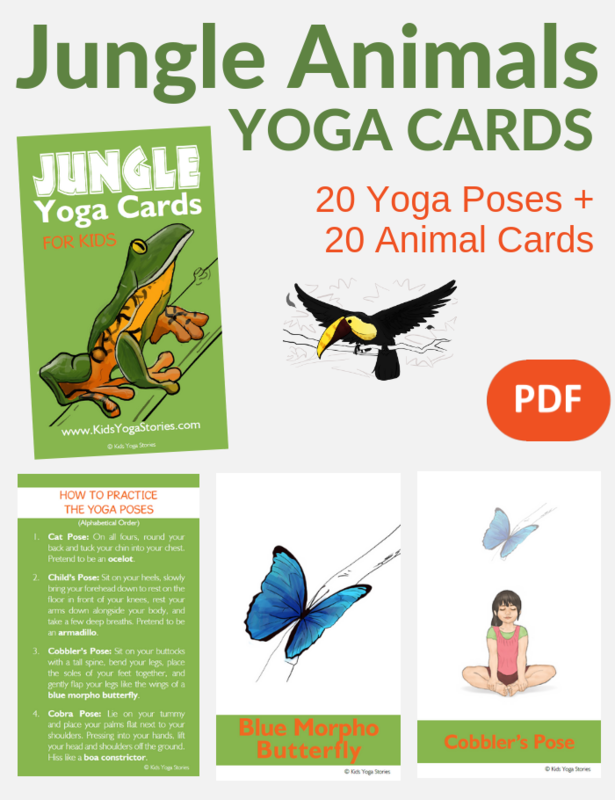 Instantly download these 52 jungle animals yoga cards to learn about the Central American rainforest through movement in your home, classroom, or studio. Includes an Index Card, Yoga Tips, Pose Instructions, 20 Yoga Pose Cards, and 20 matching Jungle Animals Cards. The multicultural yoga kids are from seven countries. Ages 3+. 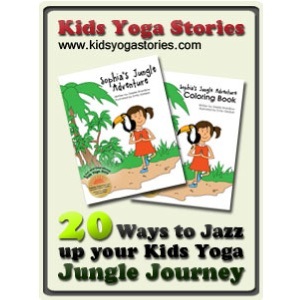 Purchase Jungle Yoga Cards for Kids here. 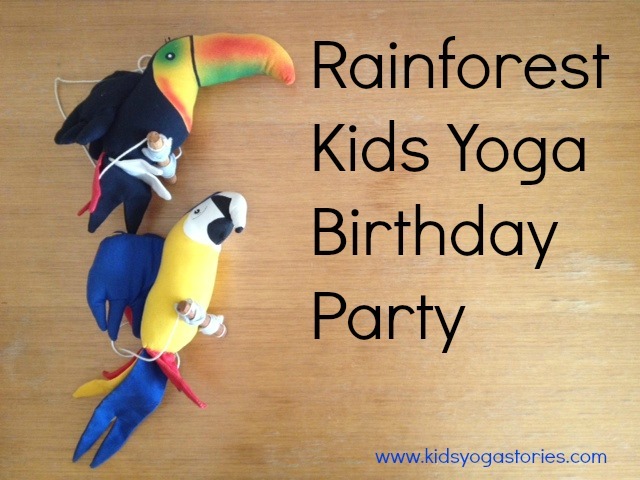 What are your favorite rainforest yoga poses for kids? For more yoga tips and kids yoga resources, sign up for our weekly Kids Yoga Stories newsletter by adding your email address to the box at the top of the page.